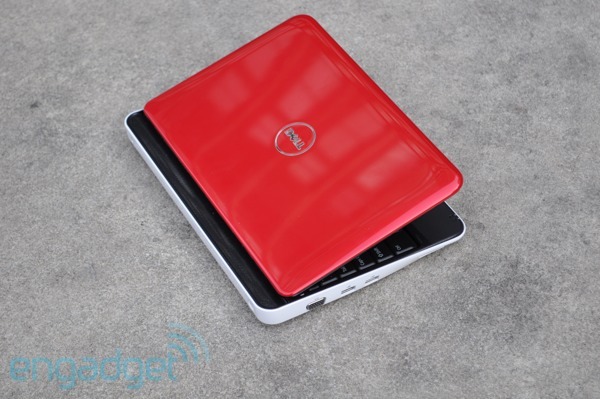 Michael Dell may not be a fan of netbooks, but you wouldn't know that from the newest Mini 10. Joining the current Mini 10v, Dell's completely overhauled the chassis and added Intel's new Pine Trail processor. But that's not all: come February the little laptop will be available with Broadcom's Crystal HD accelerator, which promises full HD playback on a high-res 1366 x 768 display. But does the $425 package rid us of our tireless complaints that Atom can't handle HD, and does it rival netbooks based on NVIDIA's Ion platform? And perhaps more importantly, can we count on the Mini 10 to be a valuable member of the growing Pine Trail netbook fraternity when it comes to battery life and ergonomics? Read on to find out! Editor's Note: This review has been updated since Flash 10.1 Beta 3 was released. What's white, black and red all over? The Mini 10 that Dell sent us. Corny jokes aside, we do like the red glossy lid, but like most Dell laptops you have to pay an extra $40 to decorate yours like a Fruity Pebble. Seriously, the requirement to pay more for a colored lid has always seemed quite ridiculous. But beyond the bright lid, we do like the new hinge which is mounted low on the bottom deck, echoing the one on the original Adamo. Beyond that, Dell scratched the previous chassis of its Minis for a more rounded, wedge-shaped lower half. But the odd shape has purpose -- the back of the system is wider so that it can house its six-cell battery, rather than have it hang off the back. 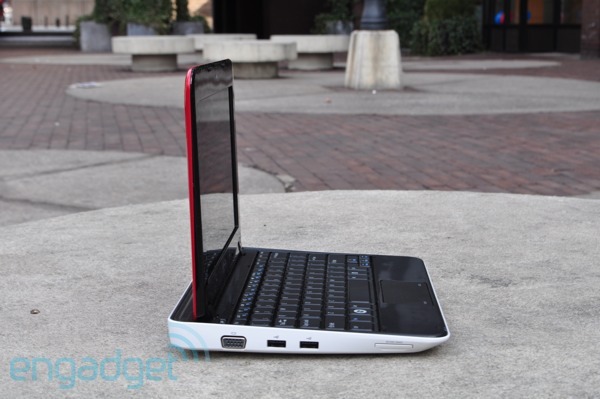 We're into the design, but it's much chunkier than other netbooks. And the three-pound,1.3-inch thick Mini 10 is noticeably heavier and wider than the 2.6-pound Acer Aspire One 532h and Toshiba NB305. Of course, with all that extra space the Mini 10 has the room to house the standard netbook ports, including three USB ports, VGA, Ethernet, SD card slot, and a headphone and microphone jack. Unfortunately there's no HDMI port -- Dell tells us the Pineview chipset doesn't support it, despite its claimed HD prowess. 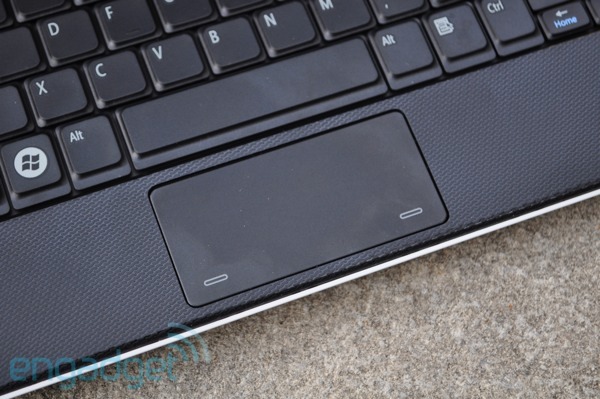 Despite the movement towards chiclet-style keyboards on netbooks, Dell's stuck with the flush keyboard layout. Though we like the slightly raised matte keys and the fairly comfortable typing experience, we still prefer the feel of the keyboard on the Toshiba NB305. But the bigger problem lies with the Mini 10's touchpad with integrated mouse buttons -- a friend of ours tried it and actually remarked that it was "atrocious." We're not convinced that it's totally unusable, but overall it's too small and the buttons are located too close to the edge. The result is a lot of double tapping and back tracking. Good thing, Dell does make it very easy to tack on an external mouse to an online order. While we could have done with a smaller, less glossy bezel, the 1366 x 768 screen is high quality and much roomier than the usual 1024 x 600 netbook resolution. Watching a 1080p clip of Up in the Air was crisp, and viewing angles were decent, but the screen is so glossy that getting it set to an angle where you aren't staring at yourself takes skill. Our Mini 10 unit was outfitted with a 1.6GHz Intel Atom N450 processor, 1GB of RAM, and a 250GB hard drive that boots Windows 7 Starter edition. Despite the fact that the Mini 10 scored in the same range as the other PineTrail netbooks, we noticed the system feeling slightly slower than the others when opening programs (it took 8 seconds to open Firefox, rather than the 532h's 4 seconds). However, once things got going we didn't notice a huge difference in performance, at least while writing this review in Microsoft Works and browsing in Firefox. Of bigger concern is how hot it runs; our palms and lap got increasingly warm when we used it while lying in bed. 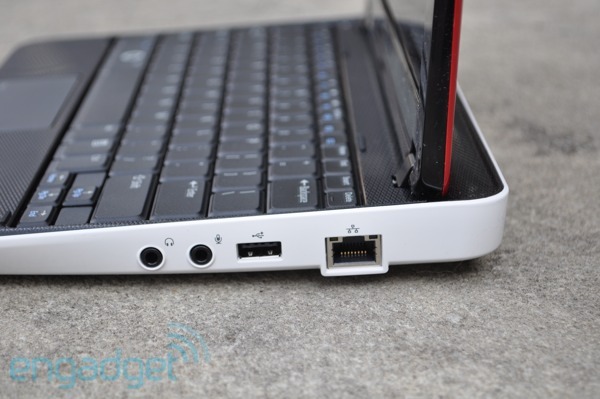 So, does the Broadcom Crystal HD accelerator put an end to our netbook HD woes? Our answer is a resounding "kind of." Firstly, we should mention that as soon as we got the unit we downloaded Adobe Flash 10.1 to see how a YouTube HD clip would play. However after a few browser crashes and some chatting with Broadcom we found out that support will not be enabled until Adobe Flash 10.1 Beta 3 is released later this month. We'll update this review when available, though it should be noted that Dell tells us they will not preload Flash 10.1 when they ship, and buyers will also have to update the Broadcom driver on their own. Though the Mini 10 will not come preinstalled with Adobe's Flash 10.1 Beta 3 or the updated Broadcom drivers that support it, users can download those tools and enjoy watching streaming HD content. And after making sure everything was installed, that's exactly what we did! A number of 1080p movie trailers played surprisingly smoothly both in the smaller screen YouTube player and when upped to the full screen. Need some proof? Check out the video below of the Mini 10 handling YouTube HD and some other 1080p CBS.com HD clips. While the playback was nice and smooth, we did have a few browser crashes here and there which we will blame on Flash 10.1's beta status. As for downloaded HD content, a 1080p WMV video of dolphins and the Iron Man 2 trailer from Apple's site played smoothly in Windows Media Player 11 -- something we'd hoped Pine Trail netbooks would do on their own. However, because Broadcom only supports Windows Media Player, that same MOV was like watching a slide-show in QuickTime. We're pretty happy we figured that out before we went and purchased Iron Man in HD from iTunes. In turn, because Windows Media Player 11 doesn't support Blu-ray playback, and Broadcom's other software partners haven't released players yet (we're told ArcSoft is working on one), playing a Blu-ray disc if you happen to have an external drive isn't an option at the moment. Our sense here is that the Broadcom chip will be a fine solution for those who just want to watch online videos once Flash 10.1 Beta 3 and a supported Blu-ray player is out -- you'll be able to hit your favorite streaming sites and playback most local video you have. But it's still no more than a Band-Aid on Pine Trail's graphics woes -- unlike Ion, it won't help with gaming or video encoding, and the Mini 10's low 3DMark scores second that. With a 56Wh, six-cell battery, the Mini 10 lasted 5 hours and 58 minutes on our video rundown test, which loops the same SD video at 65 percent brightness. While that'll let you leave the charger at home for most of the day, it isn't as long as the other Pine Trail netbooks, and nowhere near the Eee PC 1005PE's eight hours on that same test. When just used for surfing the web and listening to streaming music through YouTube, the Mini 10 lasted about seven and a half hours. We did really appreciate that Dell ships the system with a clean desktop, though the Dell dock is locked to the top of the screen for easy access to Windows applications. If you're in the market for a regular $369 (with Dell's DNDOAN8 e-vaule code) 10-inch Pine Trail netbook sans HD capabilities, the Dell Mini 10 turns out to be a middle of the road player. When it comes to thinness, ergonomics and even overall performance, it isn't as compelling as the Toshiba Mini NB305, and though its battery life is solid, it doesn't compare to the Eee PC 1005PE. But what if you're looking for a netbook that can handle HD content? Well, it's still not a perfect solution, considering the Broadcom Crystal HD accelerator only plays back content in Windows Media Player and requires you to make various tweaks to allow for Flash support. So, if you're looking for a more versatile and hassle-free HD experience, we'd have to recommend an Ion netbook like the $399 HP Mini 311 or $499 ASUS Eee PC 1201N, at least until Flash 10.1 comes out of beta and there's more software support for Broadcom.